The Bears improved to 10-5 in the league with a come-from-behind overtime win over Texas in Waco on Wednesday. It was a great revenge game for the Bears, who lost to Texas a few weeks earlier and who are one of the stories of the year of the conference and who probably have the head coach doing the best job of the 10 teams. No squad faces a tougher task down the stretch than Baylor. The last three games are at Kansas State, home against Oklahoma State and at Kansas. Maybe Baylor catches the Wildcats off guard in Manhattan this weekend, but it’s a tough ask. It’s clear that Kansas is three teams: Bad road team, good neutral court team, legendary home team. The Red Raiders ripped through the Big 12 in February — won five games by an average of 25 points — and are playing better than any other team in the league. They did lose their toughest road game by 16 points and did score just 66 points on the road in Oklahoma and were taken to overtime against OSU at home on Wednesday. So while it was incredible to watch the Red Raiders dismantle Kansas by 29 points in Lubbock, and while that was the third game in-a-row that Tech scored 78 or more points, they still haven’t played that well offensively on the road against likely tournament teams and shot poorly from 3-point range against OSU. Here are the last three games: at TCU, home against Texas and at Iowa State. The Tech-Iowa State game becomes the biggest showdown of the season if the Red Raiders get through Fort Worth and Texas with a win. Texas Tech is going to have to make shots to do it. ISU beat Tech in Lubbock and TCU lost big in Lubbock, but the Red Raiders also shot above their average from 3-point land at home. Can they do it on the road? If Tech wins out, shares a piece of the league title, it should be in the hunt for a No. 2 seed in the tournament. Kansas is terrible in road basketball games. They have two conference road wins this season and one of them was done in overtime. That said, if a team has already been to Morgantown and has to play on the road in two of their final three games, playing at Oklahoma State and Oklahoma is what you want. OSU, played amazing at Texas Tech, but overall the Cowboys haven’t been good. Oklahoma is 3-4 at home. On paper, Kansas will be favored and thus Kansas is favored to win all three games remaining. But you can’t trust Kansas on the road, so for them, it’s incredibly difficult. For other teams who don’t carry the the same gravitas and reputation of Kansas, it’s a fairly winnable stretch of three games. After the loss to Kansas on Monday, Bruce Weber talked about how the Baylor game, win or lose at Kansas, was going to be a difficult game. He actually acknowledged the very real “Kansas Hangover” effect that a lot of teams get — it happens when they beat Kansas, it sometimes happens when they lose to Kansas. But it’s a real thing. K-State coach Bruce Weber said he told his staff and the media last week that the Baylor game (this Saturday) would be the toughest in the stretch for K-State because it's the 1 after #KUbball and he knew tonight was going to be so emotional and intense. Have to be ready for BU. But you know what? If you want to win the league, beat Baylor at home because Baylor has three losses on the road in Big 12 play. If it does that, Kansas State’s last two games are at TCU and home against Oklahoma. A few weeks ago I wrote that TCU will determine who wins the league. On Saturday, The Horned Frogs play Texas Tech at home. On Monday, they play Kansas State at home. These two games will decide if we have a shared or outright champion, because KSU isn’t going to lose to Oklahoma on Senior Day. West Virginia had a moment on Tuesday. 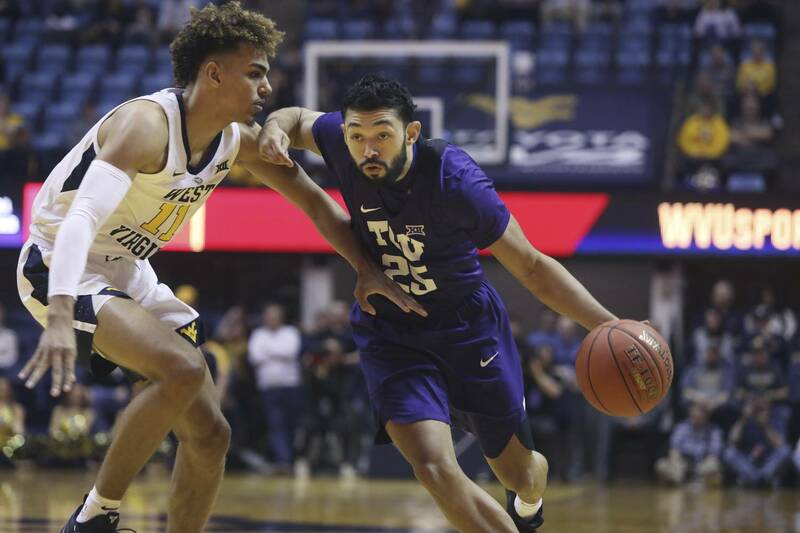 Sure, TCU isn’t one of the four best teams in the league, but the Horned Frogs are likely to be in the NCAA Tournament, but West Virginia’s 104-96, double overtime win at home was a special one for a team that had about as bad a month as any team in the league. West Virginia saw Jordan McCabe break out and Derek Culver dominate. Not everything went right for the Mountaineers, but they fought through it. And they did that despite TCU waking up late and fighting to try and win the game. Because TCU has stayed somewhat afloat, people have quietly forgotten that the Horned Frogs have lost more players than any team in the Big 12 to injury and transfers. Five. One injury, four transfers. It was the best game of the season in the Big 12 and no one will remember it because West Virginia will finish at the bottom of the league or near the bottom of the league and TCU will not win the league. I thought we wouldn’t have a better game this week, then the one game that was supposed to be the terrible one of the week, happened. Oklahoma State, coming of a 39-point drubbing at Kansas State over the weekend, traveled to Texas Tech, who just handed Bill Self his worst Big 12 loss ever at Kansas, 29 points. While Kansas Hangover Syndrome is real, it’s not as though Texas Tech was terrible against the Cowboys. They led by double-digits at halftime and Jarrett Culver dominated. Oklahoma State, however, was the best version of itself and nearly pulled off the biggest upset of the Big 12 season. Lindy Waters and Thomas Dziagwa combined for 46 points and made 13 3-pointers. They forced Texas Tech into mid-range jumpers– preventing the Red Raiders from using their obvious size and depth advantage in the post from taking over the game — and disrupted what had been the most unstoppable offense over the last five games to 3-of-19 shooting from 3-point. That’s 13 fewer made 3-pointers than the Red Raiders had in their blowout win against Kansas a few days earlier. Texas Tech’s offense looked more like the unit we saw in November, December and January, which isn’t great when a new month is approaching that matters the most. But, you know what, that performance wasn’t about Tech. It was about OSU. In a game where the Cowboys were playing walk-ons in crunch time, the fact they went toe-to-toe with the hottest team in the league was impressive. OSU kicked three players off the team in February. West Virginia kicked two off. The fact these teams aren’t completely quitting on their coach is a testament to Bob Huggins finally tapping into the team that has been the future hall of famer’s worst. For Mike Boynton, it’s another sign that he is one of the better young coaches who has been placed in two tough positions in both his seasons. Next year OSU and West Virginia should be back competing for the Big 12 and the NCAA Tournament, how they’ve played this week shows that. Adjust a handful of things, and Shaka Smart and Texas are the story of the league and college basketball season. The coach is now 15-13 overall. Texas 4-10 in games decided by six points or less. In an alternate universe, Texas is 25-3, ranked in the top 5 and hunting for a No.1 seed in the NCAA Tournament. Reality is more people seem to be convinced Smart is in his last season at Texas than they are that his the team could make the tournament this year. I think going .500 in the league gets you in the tournament. The Longhorns can still do that. But the question of Smart’s job status isn’t going to go away unless he does something that energizes his defenders, like making a run to to the Big 12 Tournament Championship Game — something this team can realistically do. Or, obviously, do something other than lose in the NCAA Tournament during the first weekend. I think some of the things Smart has had to deal with at Texas are unfair and out of his control. Suspension of key players. Injuries to key players. Random stomach viruses attacking his best rebounder before they play the best rebounding team in the league. But a lot of it has been of his own on-court decisions, so make excuses at your own risk. Here’s the best thing Texas can do to help it’s tournament chances and maybe bring back some swag: Watch the OSU-Texas Tech film. If Texas plays as hard as OSU did at Texas Tech, next week’s game in Lubbock can be a season-changing win and almost certainly puts Texas in the tournament. The questions about Smart’s status for next year will linger. Next year, Texas should have a good chance to be good — maybe even elite — but we’ve heard that before so I take it with grains of salt. The national coach of the year finalists were revealed this week. Texas Tech’s Chris Beard was the lone Big 12 representative. Uh. OK. Beard has been fantastic and was picked to finish seventh in the Big 12. They’re in first place and could win the league, could receive a top-2 seed and, yeah, they’re great. But are we serious? Scott Drew didn’t make the NCAA Tournament last season. He lost his best players to graduation, lost his best returning players for the current season to injury and is relying on a Division III transfer and Yale transfer to win games. There’s not a single player on his roster who projects as an NBA player. Baylor is one game out of first and yet Drew isn’t a finalist for National Coach of the Year? Drew is likely to win Big 12 Coach of the Year, so maybe it’s not big of a deal, but this is the best job he’s done in years at Baylor and he’s been terrific for most of his time at Baylor. Baylor's Scott Drew is the clear Big 12 Coach of the Year. Picked to finish ninth. Kansas is 2-5 on the road this season and one loss potentially ends a 14-year conference winning streak. Kansas wins both of these games, and there’s a scenario that Kansas clinches a share of its 15th straight title with a game to spare. Texas wins and they make the tournament. There’s a scenario where Tech clinches a share of a Big 12 title with a game to spare with a win. If Kansas State, Kansas and Baylor go 0-6 in the next two games, Texas Tech wins the league outright. The last road game of the season for Kansas State. The last best chance for TCU to get a win over a top-4 NCAA Tournament seed. Senior night for TCU. There’s a scenario where KSU clinches a share of a Big 12 title with a game to spare with win. If Texas Tech, Kansas and Baylor go 0-6 in the next two games, Kansas State wins the league outright. Kansas State loses, Texas Tech loses, Kansas wins: There’s a four-way tie for first place with two games remaining. Kansas State wins, Texas Tech loses, Kansas loses: Kansas State takes a one-game lead over Tech with two games left, Kansas and Baylor are two games out of first with two games remaining. Kansas State loses, Texas Tech wins, Kansas wins: Tech takes sole possession of first-place with two games left and game lead on KSU, Baylor and Kansas. Kansas State wins, Tech loses, Kansas wins: Kansas State takes one-game lead over Kansas with two games remaining. I think there’s a good chance we enter next week with four teams tied for first-place and I think there’s a decent chance we enter the final weekend with four teams tied. For Kansas State to clinch a Big 12 title on Monday it would need: Texas Tech to go at least 1-1 in the next two games and go 2-0 to enter the final game against Oklahoma at home with a 1-game lead. For Texas Tech to clinch a Big 12 title on Monday it would need: Kansas State to go at least 1-1 in the next two games and go 2-0 before playing at Iowa State next weekend. For Kansas to clinch title on Tuesday it would need: Kansas State and Texas Tech go 0-2 in the next two games and go 2-0 before playing Baylor next weekend. For Baylor to clinch a Big 12 title on Monday it would need: Kansas State and Texas Tech go 0-2 in the next two games and go 2-0 before playing Kansas next weekend. Iowa State could actually sneak back in here. Two games back, Iowa State could go 3-0 at Texas, at West Virginia and Texas Tech, and Kansas and Baylor go 2-1 and Texas Tech and Kansas State go 1-2, there would be a five-way tie for first-place at 12-6.